A great example of a mixed-use development with successful integration and co-existence between residential, retail and cultural uses. Despite management issues, the split between public and private elements has generally worked with challenges being largely overcome. The strength of the original architectural concept has withstood the tests of time, enabling the development to adapt to changing social policy and trends. The high levels of residential amenity, the design quality of the individual flats and access afforded to local facilities including cultural facilities and range of public open spaces within a densely developed part of central London. The scheme possesses a warmth and liveability perhaps less evident in many social housing schemes from a similar era. The original scheme was conceived in a very different era as a wholly private scheme. However, the management is now split between the local authority as leaseholder for the residential elements with the freeholder controlling the commercial uses. As such, the leadership and future direction for the development will be depend on resolution of issues between the various stakeholders, including local residents. A balanced community with strong levels of social cohesion are clearly evident. The development is popular, yet gentrification has been avoided and the management regime appears to be working for the community. A large proportion of units are retained by the local authority as social housing including sheltered accommodation for the elderly, with relatively low levels (approximately. 25 per cent) of right to buy. A successful early example of a car-free street with car parking and servicing located at basement levels. The public realm appears well managed, secure, engaging and enlivened. Although originally designed with 100 per cent parking provision (600 parking spaces are located within the basement), the car ownership levels amongst residents remains low. With mainline rail termini and Euston Road lying to the north, this is a part of the capital that is often overlooked by tourists. However, Bloomsbury forms an important historic district of central London, playing host to numerous cultural, educational and health care institutions including University College London, the British Museum and Great Ormond Street Hospital. 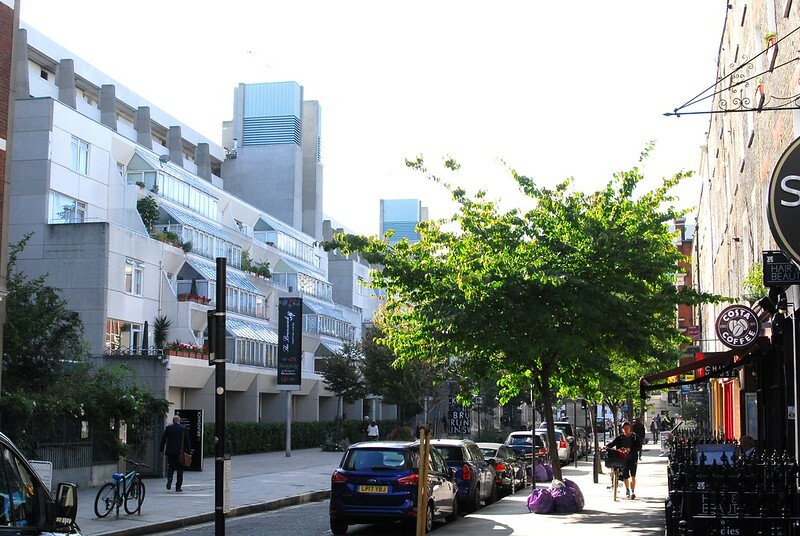 The Brunswick Centre – an early experiment in planned mixed-use development of housing with retail and commercial uses – occupies a city block between the Russell and Brunswick Square Gardens, with Coram’s Fields lying to the east. The centre is well served by the nearby Russell Square underground station. The assessment team were privileged to be guided by architect David Levitt who took us on a fascinating journey from project inception to the present day. As a young architect working on the original design team led by the architect Patrick Hodgkinson, he produced the first model of the scheme in 1963. He is now a resident. The site was originally occupied by Georgian townhouses on the estate of the Foundling Hospital. During the mid 1950s this was bought by a private developer whose plan from the outset was to clear the site to make way for two 25-storey tower blocks containing luxury flats and retail. These proposals were resisted by the borough of Camden and the developer was recommended to the consult the renowned post-war architect Leslie Martin. He championed low rise development and maintained that an equal density of development could be achieved on the site with two parallel blocks. At this stage he handed the project to Patrick Hodgkinson to take forward. Development commenced in 1967 and was finally completed in 1972. However, the original developer went bankrupt during construction and the project was sold to Sir Robert McAlpine construction. The housing element was bound into contractual obligations and completed as per the original design. After the 1964 general election, furnished tenants were given security of tenure, and Camden Council agreed to rehouse in social housing all existing tenants. In return, Camden took the lease on all the properties for social housing with a 99-year lease and low ground rent. The retail elements were excluded. Another consequence of the change of freeholder was that the building’s exterior finish was never properly finished and left as raw concrete. This did not perform well and the situation was only finally addressed during the refurbishment in the early 2000s when the buildings were painted in their originally planned colour. Although idiosyncratic, the buildings do successfully respond to the historic street geometry with the distinctive cascading terraces producing a form and sensitivity that does not impose on the surrounding streets. The residential element comprises some 406 flatted units. With equal numbers of one and two bedroom flats and some studios, all are dual aspect, feature private balconies and are served by a combined heat and power system. The windows and glazing have also been upgraded to current environmental standards. As such, the flats are highly sought after and popular with council tenants. Unfortunately we were unable to see inside one of the flats, but we were told that their internal quality and space standards are high. The tiered arrangement of the blocks creates an open aspect that maximises daylight to the individual units with the concrete structure providing effective noise attenuation. The residents enjoy access to a range of open spaces – including the nearby squares and a small community garden on a gap site to the northern edge of the centre. The communal terraced areas at second floor level are currently being refurbished, but we understand these have been popular with some residents and may incorporate play equipment in the future to meet the increasing numbers of families with young children. Sadly, these works have seen the removal of climbing foliage to the buildings, which contributed strongly to the centre’s character. Their eventual reinstatement would be a positive step. The retail offer has changed during the life of the development. The centre was originally the focus of more traditional retailers before experiencing relatively high levels of vacancy during the 1990s. The refurbishment undertaken by the then freeholder saw the retail floorspace being reconfigured, with frontages extended forward to create a tighter central precinct, which has resulted in more concentrated footfall. Those changes saw the opening of more high street chains and restaurants, and it would appear that the new freeholder is continuing to successfully tap into the commercial potential of the centre, though with increased rents several clothing shops have closed as shoppers move online, and been replaced by more food outlets. There is a health centre in the precinct and a successful art-house cinema continues to operate within the basement void of the centre. The large Waitrose is very successful. Although the retail centre remains largely inward looking with a general absence of active ground floor uses to the perimeter, the public realm is busy, popular and well maintained. New water-features and artwork to the central precinct have greatly enlivened the space, which serves as a focus for informal gathering with activities such as table tennis provided by the centre management. The dual management of the development, which is split between Camden Council as leaseholder for the residential elements and the freeholder for the commercial uses, has and continues to present challenges. But these have generally been overcome, perhaps, in part, through the efforts of the vocal tenants and resident group. The buildings have been successfully refurbished and the shared residential circulation spaces were clean and tidy. Recent issues regarding water ingress from the second floor terraces to the retail units beneath are currently being remedied by the freeholder. Despite government moves to sell off social housing tenure and new threats from the likes of AirBnB, a balanced community has been sustained. Only about 25 per cent of the units have been subject to right to buy (many of these are now buy to let), with the remainder retained by Camden Council as social housing, and about 25 per cent of the flats are sheltered housing, which is very popular. The scheme possesses a uniqueness, warmth and liveability perhaps less evident in many social housing schemes from a similar era. The assessment team observed a harmonious, social place with a good level of social exchange within the development. A room for meetings and activities has also recently been provided for community use. The circulation spaces invite conversation. The development became Grade II listed around the year 2000 and whilst the modernist style is not universally liked, clearly the decision to afford statutory protection affirms its architectural and historic significance. This is an exemplar of post-war architecture and planning for schemes of its kind. It has withstood the tests of time both physically and politically and is continuing to evolve to sustain a vibrant mixed-use community. In a year when the capital’s social housing stock has hit the headlines for tragic reasons, it is important to recognise success.